Litao Zhong, assistant professor of economics and finance, received the Teaching Award for New Faculty. This award recognizes excellence in teaching by an untenured faculty member throughout their first four years at IU East. Jamie Buffington-Adams, assistant professor of education, is the recipient of the Progress Award for New Faculty. 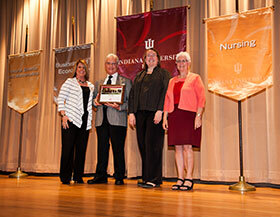 The Progress Award is a symbol of achievement for new faculty members as they are establishing their careers at IU East. This award recognizes exceptional progress in teaching, research and service. Steven Petersheim, assistant professor of English, received this year’s Award for Excellence in Research. This award recognizes excellence in research and/or creative work by a full-time faculty member over a sustained period of time. Tonya Breymier, associate dean for Nursing Graduate Programs and assistant professor of nursing, is the recipient of the Distinguished Faculty Service Award. This award recognizes distinguished service—campus, community or professional, either one-time or sustained, by a full-time faculty member above and beyond the standard expectations of any compensation or release time provided for the service. Amy Jarecki, associate director of Financial Aid and Scholarships, received the Professional Council Service Award and Roger Cowan, network and telecommunications technician for the Office of Information Technology, received the Staff Council Service Award. Hope Peer is the recipient of the Student Employee Service Recognition. The recognition honors a student employee who has demonstrated excellence in attitude, commitment, teamwork, contribution, and inspiration in their job at IU East. Peer is a senior psychology major. She has assisted many community organizations such as Centerstone, the Mentors for Early College students at Hibberd Middle School, Opening Minds through Art, the Grassroots Action Resource Center, the Richmond Parks Department’s Just Us Kids Outdoors (JUKO) program, the Women in Transition (WIT) House, and the IU East Summer Tutoring Program.